Rointe have clearly spent a lot of time in the look and feel of this radiator to ensure that it can fit seamlessly into any environment, be it residential or commercial. 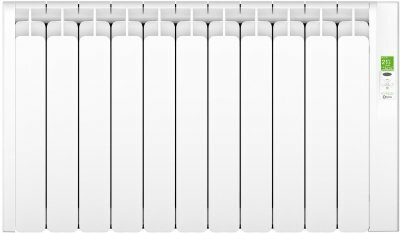 Their elegant and slim line design, coupled with a non-fading pure white finish, give this radiator a stylish and minimalistic look allowing it to blend into any environment. The Rointe KYROS radiators are easily programmable 24 hours, 7 days a week via the Infrared Control Remote, Infrared Basic Control or control mode via the TFT screen. The new control mode available via the access menu has been designed to facilitate the ease of use and programming of the KYROS range. These menus have been designed using identifiable icons for easy recognition, improving accessibility and enabling access to all functions. The Rointe Kyros KRI1210RAD3 is ideal for medium to large sized rooms and can heat an area up to 9m2. Rointe radiators make use of "Fuzzy Logic Energy Control", a low consumption energy saving technology which allows the optimisation of the radiator’s power consumption. Originally developed by the R&D department of Rointe for the D Series Radiators, the same technology has been applied to the KYROS range, and having been tested by independent laboratories, has proved to save up to 62% in comparison to heating devices with no thermostat. On top of the low consumption technology, all KYROS radiators feature the new Equilibrium energy saving mode, which forces to the radiator to work at 19ºC in Manual Mode to save energy and improve efficiency. Common lifestyle - The heating works in Eco Mode in the morning, from the moment you leave home to go to work. Split shift - Preset designed for workers who come home at lunch time and return to work in the afternoon. Home lifestyle - The heating system keeps a stable temperature throughout the day. Ideal for the elderly and people who spend the majority of their time at home. Office - Ideal for businesses and offices where most activities are carried out in the morning. Really quick delivery surpassed all of my expectations. Rads working great. Thank you very much for the really great review of our service and fast free next day delivery, we are really pleased to have surpassed your expectations. Very neat good design and it looks fabulous on the wall in our garden room .....lovely and warm ! Thank you very much for taking the time to review our service as excellent, we really appreciate the fantastic feedback. Excellent phone service from the salesman. Super quick delivery. Excellent packaging. Thank you very much for your really great comments, I will pass this fantastic review on to Jack. Thank you for taking the time to review our service as excellent, we appreciate your comments. Thank you very much for your really fantastic service and product review. We appreciate your feedback and comments on changing from strorage heaters to new Kyros electric radiators. Really easy to install (simple to use wall template supplied) and looks good on the wall. 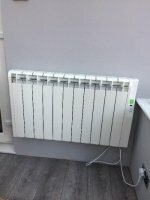 Rointe have an excellent reputation and the radiators we already have work really well. They are a bit pricy but you get what you pay for. They always seem to get good reviews..! Brilliant service. Easy to order and FREE next day delivery- what’s not to like..!! Thank you very much for your review. We pride ourselves on our fantastic advice and customer service, so feedback such as yours, is really great to hear. We have been very impressed with the performance of this product in our office environments. Excellent service from initial enquiryt o final purchase. Fast and efficient. Excellent service. Not all heaters are on the walls yet but the ones that are, are working fine and doing their job. That is really great to hear, thank you for the great 5 star review. That is brilliant to hear, thank you for your great comments. I dealt mainly with Joe. He was always very knowledgeable and helpful. Items arrived safely and quickly. Thank you for the really great review. I will pass on your wonderful comments to Joe. Easy to use website excellent products and product information. Free next day delivery. What more could I ask for. Thank you for your great feedback. We work hard to offer the best service possible. If we can be of any further assistance in the future then please call 01473 276686. Looks good and performs well. They are excellent at delivering the product quickly and at a competitive price. We have bought 4 of the type of heater - replacing storage heaters - and installed two in our daughters flat and two in another flat that we own. Excellent product and service. Thank you for the the really fantastic review of our consistently great service and 5 star rating. Looks good! Works fine - will know more when i move in to my new house! Well done to The Heater Shop! Ordered a Rointe radiator on the Wednesday - arrived on the Friday! Excellent service! Will certainly recommend this company! That is really great, thank you for the 5 star service review and recommendation. Brilliant - thank you for the fantastic feedback. Brilliant service. Delivered free and next day. Our FREE next day delivery is very popular and a fantastic service that we are able to offer our customers. 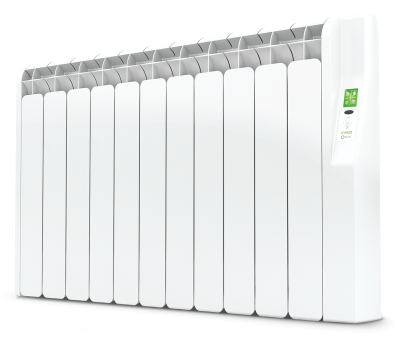 The NEW Second Generation Rointe Kyros electric radiator!